All money goes to improve school infrastructure and cover the wages of teachers- no admin expenses are paid with your donations. Matjana Preschool is a non profit organisation which does not receive funding from the Swazi government or non government organisations. It was opened on a shoestring budget and has now been operating for more than one year. In that time we've raised enough money to improve the school infrastructure and pay two local teachers, but we're still struggling to secure a financial base. Our funds are currently low and we urgently need your financial assistance to ensure our teacher receive their paycheques and our kids have a heater this winter. Give us your money: raid your piggy bank or the stash under your matress. Small or large amounts will be gratefully accepted. Party for a good cause: invite your mates around and sell them food or beer, or take a collection for the school "at the door" (or when everyone's really drunk). It's a good excuse to party. Pass the hat: at work, church, the pub, the street. Ask your friends (or complete strangers) to throw in their coins. You could even guilt trip them by showing photos of the cute children. Tell the world: forward our web address and info to your friends and let them know that we're a good cause if they are thinking of donating to one. Please Email Us to let us know the details of your contribution. Matjana Preschool has received E1800 since the last newsletter, money raised by Canadian photographers Tracey Wallace and Robertson Bales. They visited the school last year, took some fantastic pictures of the kids and printed a calendar, which they then sold in Canada to raise money for the school. We thank them for their creativity, and not only raising some funds but also helping spread the word about what the preschool is doing in kaPhunga. For the first time ever, Matjana Preschool has started the year with money in the bank, knowing that is will be able to pay its teachers their new increased living allowances (our wage bill has increased from E1200 in 2008 to E1700 in 2009) for some time to come. We’re still not in a position to pay Ncobile and Fortunate a full wage, but they were happy to receive an increase and know that the work they are doing at the school is also developing their skills and preparing them for future opportunities. The school currently has enough money to pay their wages for almost the entire year, meaning that any money we fundraise this year, will be available for new projects and infrastructure developments. It’s an exciting time for the school, as we’ve been wanting to further improve the school’s infrastructure for some time (i.e. build a new classroom), and more than ever, it looks like that may be possible this year. Keep you eye out for more info in the future and please, keep the donations coming into our bank account (sorry, there’s still no paypals!). Matjana Preschool has continued to raise money in November and looks set to finish the school year with money in the bank– that’s a big relief after closing last year with just enough money to buy each child a colouring book and pencil for a graduation present. We received a contribution of 4500 emalageni from a group in Italy– thank you very much for your second substantial contribution. We also raised about 1500 emalageni at our annual fundraising party– thanks to Woza Nawe tours for their help in organising and promoting the day. Donations remain, as always, more than welcome– we feel our new brick classroom getting closer and closer, so if you want to give a Christmas gift that really makes a difference, don’t forget Matjana Preschool!. The annual Matjana Preschool fundraising party was held on Saturday October 4. It was a fun day for everyone and the school raised money by selling food and organising competitions (these included a three legged raise and lucky dips. Children from Matjana Preschool and Primary Schools performed traditional Swazi dances and a number of tourists and expatriates , join us for the day (thanks for your donations!). Our treasurer’s been on holidays, so we don’t know how much money was raised yet- keep you eye out for more news and photos of the day in the next newsletter. 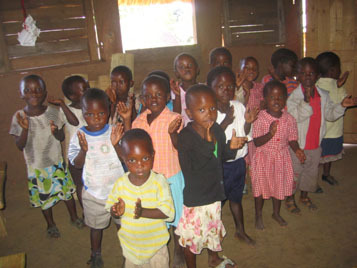 Financial contributions to Matjana Preschool continued in July. We received a massive 1000 pounds from a couple of British sponsors, which sounds like even more in emalangeni– its about 15, 000. The school committee have not yet met to decide how best to spend the money, but this generous donation will put us in a good position to begin our building project. The teachers are also pleased to know that they won’t need to worry about where their pay is coming from for a long time. The committee is also planning a fundraising party, similar to the two parties which were organized last year. Traditional Swazi dancing will be performed and food served to raise money for the school. But your donations remain more than welcome. The initial response to last month’s appeal for funds has been fantastic–thanks to everyone who’s donated so far. We received a 300 euro donation from a group of Italians– it’s the second time they’ve made a substantial donation! Robertson Bales and Tracey Wallace, Canadian photographers who visited the school in March have also been collecting donations for the school. We now have sufficient money to pay the teachers for the next couple of months. There should also be enough left over to splurge on an excursion or a heater.But we still need your support so we can continue with our long term plan of constructing a new classroom. April has been a quiet month for Matjana Preschool Fundraising. We received E100 from a couple of Austrian tourists who heard about the school while staying in Manzini. The school is currently low on funds an we’ve decided to try some new fundraising ideas, as the ideas of funding the school solely through tourism isn’t really working as well as we’d like it to. We’re launching a sister schools program and will be finding and asking preschools in developed countries to become sisters schools, share photos and stories of kids and help us raise funds. If you have kids or nieces or nephews attending preschool or know someone who’s a preschool teacher, please help us by asking if they can help us. Details of the Sister school’s program can be found on our web page. We’re also planning another fundraising party, and hope that third time around we’ll have great weather and make a fortune. In the meantime, the bank account is running dry and we would really appreciate cash donations for those who are in a position to give. A donation of 100 euros will pay Ncobile and Fortunate’s wages for a month, so to give an idea of how far your money will go. Matjana Preschool’s Fundraising efforts have continued in 2008, but in February the school did not receive any cash donations (BOO HOO!). However two professional photographers who were visiting Swaziland to document the country’s International Women’s Day march, donated their skills and time to take some wonderful picture and video footage of the school. They have given the school a number of photos and will edit the video footage to make a short promotional documentary about the school when they return to Canada. Siyabonga kakhulu Rob and Tracey! 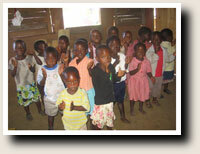 The 2008 fundraising year started with a BANG for Matjana Preschool. We received our biggest donation to date– E5990 (AU$1000) on January 4. The money was donated by an Australian Grandmother who raised the money baking and selling Christmas cakes. Everyone at Matjana Preschool says thanks to those who purchased the cakes and “Siyabonga kakhulu Gogo Brear”- your efforts have inspired all of us. The money has allowed us to purchase new desks and chairs for the kids (E2500) and teachers (E1500) and will also contribute to our operating costs. We also received a world map in the mail, a wonderful addition to our classroom which receives lots of international visitors. We want to keep the fundraising ball rolling , so if you’re thinking about raising funds for the school, let us know how we can help (e.g. by sending photos or information). 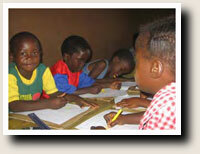 Matjana Preschool has received over R5000 since our last newsletter. A group of Italians (who went to the trouble of ordering and sending us an emergency credit card to allow us to access the money!) donated 250 euros (R2500),while an Australian couple collected AU$500 (R3000) for our little school at their wedding. A group of American students donated R800 while they were visiting Kaphunga with Woza Nawe tours and we’re expecting a donation from an Australian grandma who’s told us she’s been raising money for the school selling Christmas cakes. So, despite the failure of our end of year fundraising party to raise funds for the school, we’re now in a good position to start 2008 with new furniture and work toward raising enough funds to construct our new classroom. Thanks and keep the donations coming! Donations of cash and kind have continued to improve the infrastructure at MPS and cover its day to day expenses. In August and September we received cash donations of over R1600. This money paid the teacher’s living allowance and covered a few one off purchases (e.g. the school’s official stamp). We also received donations of 19 toothbrushes and toothpaste, colouring pencils and other stationary supplies, beautiful illustrations for a Swazi folk story and school photos for all of the kids (each child received a individual and class photos and a photo with the teachers). Thanks to everyone who’s helped! It’s not too late if you’d like to make a contribution! In June and July Matjana preschool received about R2600 in cash donations. With this money we replaced the wooden shutters with glass windows and paid the local teacher’s living allowance . We also received some fantastic teaching resources– books, paint, glue, crayons, skipping ropes, puzzles and African animal toys, amongst others. These teaching resources are already making a huge difference, to a classroom that previously operated without a single storybook! Matjana Preschool is slowly improving, but we urgently need more donations to cover our operating expenses and continue improving the infrastructure. Small donations can go along way in a country like Swaziland– large ones go even further. At the Matjana Community Preschool inaugural fundraising party, Ndabeni’s women and children turned out in droves and put on a remarkable display of traditional Swazi dancing. For more information visit the Inaugural Fundraising Party Page. We raised R1100 in April and May (mostly at the inaugural village fundraising party). This money will be used to cover our operating expenses for the second term (i.e. buy paper, pencils, pay for internet access, etc.). We’re still hoping to raise money to modify our classroom before winter (e.g replace the wooden shutter with glass windows). Michelle Brear, the school’s treasurer and fundraising coordinator believes the school’s registration will also assist the fundraising campaign. “To date the school has not had a bank account, so donations have been accepted through the accounts of the school organisers. It worked well enough to get the school started, but now we will be able to open a bank account in the school’s name. “I think having a school bank account and a constitution will also show potential sponsors that we’re serious and legitimate and make them more likely to donate money,” she said. A huge thanks to everyone who has donated or committed to raising money so far. 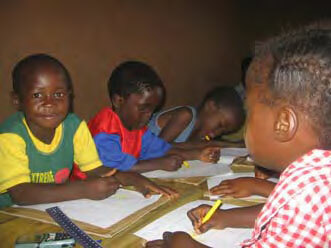 We’ve raised about R2200- enough to buy basic classroom furniture, teaching materials and stationary. We’re holding a fundraising party (on location) in April (we hope this will raise another R2000). A group of Australian high school students have voted to raise funds for the school in their career development class. It’s a great beginning. But we still need money to provide more teaching resources, modify the classroom, improve classroom furniture and pay the teachers’ living allowance.